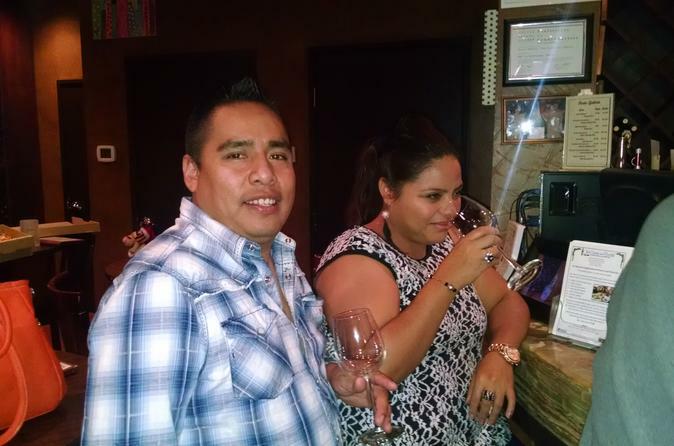 Celebrate Saturday night with a 4.5-hour guided wine tasting tour! You and a small group will enjoy a fun wine tasting paired with a tantalizing cheeseboard at a terrific Dallas winery, followed gourmet pizza at a terrific restaurant and scrumptious chocolate desserts at some of the area's sweetest hot spots. Then check out exciting live entertainment at a cool venue. The price includes transportation via private motorcoach, food samples, wine tasting and beverages on the motorcoach. You may also BYOB on the motorcoach or to the pizza restaurant. (Don't bring alcoholic drinks to the winery.) Guests must be 21 years or older. Enjoy a lively wine tasting at a prominent Dallas winery/wine bar, in a cozy atmosphere, accompanied by delicious pizza and a cheeseboard. Travel all over town on a luxury motorcoach with an expert tour guide who brings added fun. Beverages provided (you can also bring your own). Pop in to the hottest chocolate venues for indulgent treats. Celebrate the evening with live music at a terrific venue, from jazz to soul, depending on the tour date.